Are Australian bond-like proxies going to suffer a bondcano moment? Certainly, stocks that have defensive characteristics have been sold down in recent months. And bond bears would have it that they are collateral damage from rising US yields. However, we believe this is a false narrative. Hence, we need to go back to first principles to sort out perception and reality. In recent months, the aggressive sell-off in Australian bond-like stocks looks like they are more correlated with the rising US bond yields rather than Australian bond yields. Fundamentally, this should never happen. No rational investor would buy an Australian asset and fund it with US debt. Otherwise, there is a huge basis risk in terms of the cash flows generated from an asset in one country and the finance cost associated with another country. US interest rates drive US asset valuations. Australian interest rates drive Australian asset valuations. Zimbabwean interest rates drive Zimbabwean asset valuations. To illustrate how Australian interest rates affect the pricing of Australian bond-like stocks we use Spark Infrastructure (SKI) as an example. 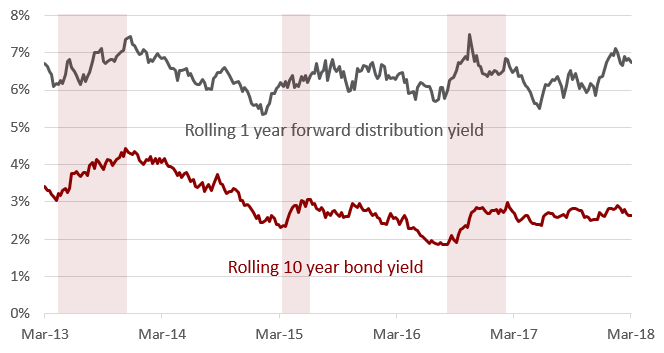 The chart below plots the rolling 1-year distribution yield of SKI against the Australian 10-year bond yield over the last five years. Given the heightened fear of an Australian bondcano event in recent months, we have also shaded historical bond sell-off periods (light red) to provide perspective. Historically, when SKI’s yield was rising (that is, share price was falling) it mirrored rising Australian bond yields. This implies that the stock market is not very good at forecasting, but is generally good at marking to market with interest rates in real time. This is a hallmark of an efficient market. However, for the first time in five years SKI’s yield has skyrocketed while there is no evidence of an Australian bond sell-off. Is this an example of an efficient market or a mispriced opportunity? Our view is that SKI’s valuation being priced off US interest rates is fundamentally incorrect. On a technical note, the bond experts will recognise that SKI’s cash flows resemble a variable interest rate security. If you believe interest rates are going to rise in the future then SKI future cashflows will also rise. Given that SKI owns monopoly assets, the regulator sets its cash flows based on a return on capital that is largely influenced by interest rates. The valuations of variable interest rate securities simply should not change that much from interest rate movements. With so much media attention on interest rates (risk-free rates), many commentators are confusing risk-free rates with discount rates. Valuations are driven by an asset’s discount rate which is comprised of two components: the risk-free rate and a risk premium, where the risk premium reflects the riskiness of cashflows given that assets are not riskless. Changes in both interest rates and risk premium drive valuations, not just one of these in isolation. Sure, rising interest rates will put upward pressure on the discount rate but if it is countered by a wide and shrinking risk premium then valuations can be preserved. Alternatively, if risk-free rates are benign and the underlying asset yield rises it implies the risk premium has expanded. The million-dollar question for investors is whether the wide risk premium represents a disconnect between perception and reality of greater risk. Let’s use another bond-like stock, Sydney Airport (SYD), as an example. 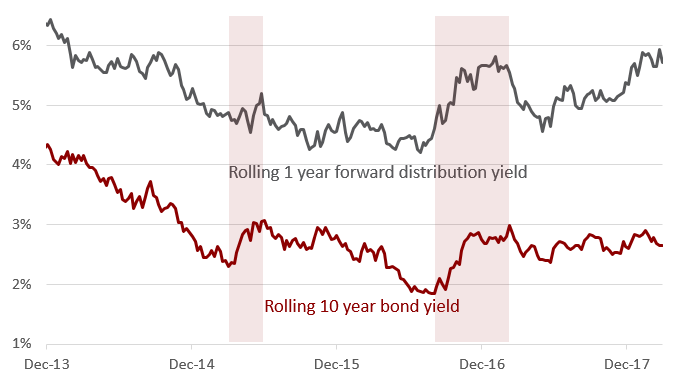 The following chart plots the rolling 1-year distribution yield of SYD versus the Australian 10-year bond yield since its corporate restructure from Macquarie Airports in late 2013. Like SKI, the recent rise in SYD’s distribution yield also looks like SYD’s share price has been priced off US interest rates, which we know is fundamentally incorrect. The recent sell-off has been so dramatic that the yield spread is at the highest level over the last five years. The only feasible explanation for SYD’s widening yield premium is that the business may be under stress. The first thing that came to our mind regarding risk was SYD’s gearing levels given its historical relationship with Macquarie Bank. Maybe SYD’s balance sheet under pressure? SYD used to be highly geared when it was owned by Macquarie Bank. Not anymore. Over time its leverage ratio has been falling and is expected to continue in the future. The improved balance sheet has been confirmed over the last few months by Moody’s and Standard and Poor’s which upgraded SYD’s credit rating to Baa2 and BBB+ respectively. If the deleveraging continues SYD will be on a path to receive an A credit rating by early 2020s. Maybe debt funding costs have skyrocketed? Like Australian bond yields, Australian BBB corporate interest rates have fallen over time and has been relatively benign over the last few months. Further, SYD’s debt refinancing risk is low because there is no significant debt maturity in the next couple of years. As a sign of conservative management, SYD is paranoid about managing its debt. To ensure that its average debt maturity is long dated (around 8 years) and most of the interest rate risk on their debt is hedged (about 93%) they purposely overpay on their debt cost (5% interest rate versus the equivalent Australian BBB interest rate of 3.4%). Not many companies take an extremely long-term view on managing their debt. In summary, when leverage ratios are falling with a benign debt funding environment, risk also reduces. Bond experts will recognise that securities which are deleveraging command a shrinking risk premium. If the balance sheet is not under stress, maybe the high yield premium is due to the growth outlook deteriorating? SYD’s profitability is directly linked to the number of passengers traveling through the airport. Prior to 2016, total passenger growth was growing around 3% per annum. From 2016, total passenger growth was +4% per annum. The step change in growth has predominantly been driven by international passengers. The elevated passenger growth over the last couple of years have driven EBITDA growth by 9% per annum. There is a lot to like from SYD’s exposure to future passenger growth. And the outlook has become clearer and better since 2015 for four main reasons. China’s recent five-year (2016-2020) plan highlights 50 new airports to be built including Beijing’s new mega airport, which is due to open in 2019. More airports will allow the growing Chinese middle class a greater opportunity to travel. With 10% of Chinese nationals holding a passport it highlights significant untapped travel demand. Over the past five years, Chinese visitors have consistently grown by more than 15% per annum and now represent about 8% of SYD’s total international passengers. Importantly, China and Australia signed an open skies agreement in 2016, which means that current passenger growth from China is likely to be sustained. SYD has three terminals where terminal 1 (T1) is dedicated to international travel and terminal 2 (T2) and 3 (T3) are dedicated to domestic travel. In 2015, when SYD bought Qantas’ T3 lease it was processing about 10 million passengers versus 15 million passengers travelling through T2. In our view, there is enormous scope to increase T3’s asset utilisation. SYD has proposed a new terminal, T4, which is expected to be built around mid-2020s. Qantas is expected to operate both its international and domestic services from T4. Hence, the new terminal will free up valuable capacity in T1 for more international passengers. WSA is expected to be built by the mid-2020s and serve around 3 million passengers (in comparison SYD served 16 million international and 27 million domestic passengers in 2017). Notably, around 80 percent of WSA passenger demand would be for domestic use. On the surface, it may seem like a competing airport would crimp SYD’s profits. However, SYD suffers capacity constraints during peak periods. Hence, by diverting domestic passengers to WSA, SYD can free up valuable capacity during peak times for more international flights. With a growing mix shift to international passengers, SYD’s operating outlook is brighter than ever. In the long term, it is foreseeable that SYD could process more international passengers than domestic passengers. It’s not hard to do the maths on SYD’s future profitability when international passengers deliver 4x more revenue than domestic passengers on a largely fixed cost base. Given the leverage to international passengers, by the time WSA is built SYD’s future profits could be double last year's profit. With a stronger operating outlook, SYD’s yield premium over bonds should at the very least narrow not expand. To sum up, in early 2014 when Australian bond yields were around 4%, SYD had a 6% distribution yield but had a weaker balance sheet and tepid growth expectations. Currently, Australian bond yields are under 3% compared to SYD offering a similar yield of 6%, but with a strengthening credit and operating outlook. Can you spot the disconnect between the perception of fear and the business reality? Thanks for the article Jason. I think you make some good points about the operational performance of SYD, but I don't understand why you're so dismissive of the link between Australian Bond-proxy equities and US interest rates. You seem to make a fundamental assumption that Aussie bond-proxies are not linked to US bond yields ( which seems incorrect to me) and then every subsequent assumption flows from this. US interest rates have a massive effect on other global interest rates through a whole range of mechanisms. Australian bond yields are more highly correlated with US bond yields than with Australian cash rates. It doesn't make sense to ignore that link with a sweeping statement that it's "fundamentally incorrect". Both SKI and SYD continue to be priced based on US 10 year bond yields. If you replaced the Australian 10 year bond yield with the US 10 year bond yield when comparing to SKI and SYD dividend yields, you'd still see a very high correlation over the last 5 years, but would not see the divergence of recent months. You note that the market is very good at marking to market in real time and this is a hallmark of an efficient market - but assume that the market has suddenly become inefficient when an entirely obvious alternative (that they are priced against US bonds) is available. You even reference SYDs balance sheet and the level of hedging debt is hedged, but don't make the link that it's hedged because a significant portion is raised in international bond markets. It seems clear to me that Aussie bond-proxies ARE price off US Bond Yields. So I'd be interested if you have any further detail to support the notion that they not. James, thanks for your comments. Correlation does not mean causation so please read my previous “Run for the hills” livewire post to understand how the US and Australian economies have diverged in recent years. And yes you are right, SYD and many other Australian companies access international bond markets. However, these interest rates are priced based on Aussie rates (plus a margin if they want to hedge). I’m sure it’s possible for Australian companies to finance their operations with Japanese debt or any other denomination but no company does this as this is a clear sign of mismanagement. Stefan, good question. SYD’s dividend is about 2x their accounting profits. But SYD does not set their dividend policy on accounting profits as there are large non-cash items (eg. depreciation). Since their restructure from Macquarie Airport in late 2013, SYD has paid 100% of their dividend from cash profits. Hence, SYD’s dividend is sustainable. Page 14 in SYD’s FY17 results presentation highlights the difference between accounting profits and cash profits. There are two follow-up questions you may ask: Why does capex not equal depreciation like normal companies? This question relates to the useful life of the asset. Infrastructure asset useful lives are very long versus industrial companies. If you divide SYD’s depreciation by the PPE, it implies that the useful life is around 20 years based on Australian accounting standards. However, SYD’s concession to operate the airport last to 2097. There is a mismatch between actual useful life (79-year concession life) and accounting useful life (about 20 years). For example, SYD depreciates their runways over 30 years even though the assets probably last 100 years. Sure, there will be maintenance capex but the bulk of the capex was made upfront and won’t be repeated. Given that SYD’s capex program over the last couple of years has been elevated and will continue to be in the next few years you should expect higher depreciation affecting their accounting profit. Why does SYD not retain some earnings like normal companies? This question relates to the capital structure of SYD. If SYD retains earnings their balance sheet will degear more aggressively. At a 100% payout ratio on cash profits, the balance sheet is already degearing but at a slower rate. SYD is a very unique business where they can have an elevated capex program funded from debt while their balance sheet is degearing at the same time.